A close look at one such power plant in Vietnam, the Nghi Son 2, reveals that Singaporean banks are not alone in this activity. According to Market Forces, an affiliate of Friends of the Earth Australia which analyses the financing of development projects, funding will not only come from the above-mentioned Singaporean banks, but also the UK’s Standard Chartered, the Korea Export-Import Bank, the Japan Bank for International Cooperation and several Japanese commercial banks: Mizuho Financial Group, the Bank of Tokyo-Mitsubishi UFJ (MUFG) and the Sumitomo Mitsui Banking Corporation (SMBC). Financing for this USD2.5 billion coal-fired plant, to be located in Thanh Hoa Province just north of central Vietnam, is expected to be finalised by the end of this month. Unwinding the finances behind a blockbuster project like Nghi Son 2 isn’t easy, but Julien Vincent, executive director of Market Forces, explains how such funding is generally structured. The involvement of these state-linked organisations signals that a project is safe enough for commercial banks to enter the equation and provide further financing. Since funding for Nghi Son 2 has not yet been confirmed, it is unclear exactly how much each bank is set to contribute. But the fact that they’re involved at all is worrying, as the power plant would breach some of their own regulations. Several independent analyses of Nghi Son 2’s Environment Impact Assessment (EIA) have concluded that the project would be disastrous for the local environment. Market Forces estimates that the plant would create twice as much CO2 for every unit of generated power in comparison to the average thermal facility in Vietnam. A report titled “Comments on the Environmental Impact Assessment (EIA) of Nghi Son 2 Thermal Power Plant” by the Hanoi-based Green Innovation and Development Centre (GreenID) points out numerous red flags. For example, the plant is just one part of the planned Nghi Son Power Centre, which would include two other coal-fired plants. The EIA, which runs 375 pages and is only in Vietnamese, fails to take one of these other facilities into account, and therefore doesn’t present the cumulative impact. These power plants will also be located within the huge Nghi Son Economic Zone, home to other industrial sites such as steel and petrochemical refining plants, ship yards and consumer goods export facilities. The EIA excludes these factors when accounting for overall emissions. 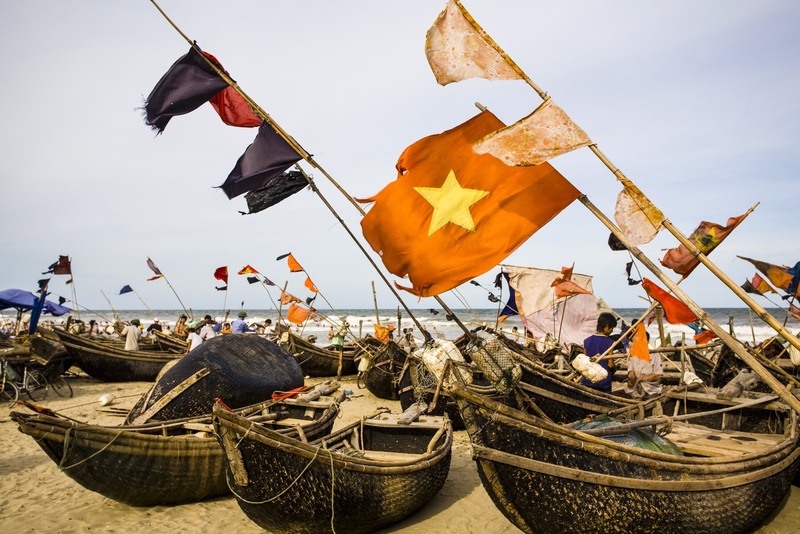 The NGO’s studies of ecosystems around four other thermal power plants with similar capacities elsewhere in Vietnam found that fisheries have been decimated. According to their report, fishermen have had to quit fishing in certain areas, while fish farms have had to be relocated away from contaminated water. DBS and Standard Chartered have borne the brunt of the criticism over Nghi Son 2 financing and how it relates to their corporate environmental policies. Tuong and her organisation have taken direct aim at DBS in a separate online petition addressed to Peter Seah, DBS’ chairman, and Piyush Gupta, the bank’s CEO. The letter refers to Nghi Son 2, as well as three other coal-fired power plants that DBS is considering funding in Vietnam. DBS did not respond to request for comment for this article. Meanwhile, The Straits Times recently reported that Standard Chartered is reconsidering its potential support for Nghi Son 2 since technical analysis of the project’s Environmental Impact Assessment has revealed that the completed plant would breach the bank’s own publicly-stated position on climate change and energy. Standard Chartered’s statement on the issue says that the bank “[w]ill not provide debt or equity to new coal-fired power plants which do not achieve a long-run emissions intensity of below 830g/CO2/kWh.” The measurement refers to the amount (in grams) of carbon dioxide per kilowatt-hour of energy production. Lauri Myllyvirta, Greenpeace’s Beijing-based coal and air pollution expert, estimates that Nghi Son 2 would have an average emissions intensity of 890-900g/CO2/kWh, well above the bank’s limit. But DBS and Standard Chartered aren’t the only banks running the risk of breaching their own commitments. Like Standard Chartered, Mizuho, MUFG and SMBC are also members of the Equator Principles. Members of this group, which includes 92 global financial institutions, commit to more rigorous standards for project financing and environmental policies. Requests for comment were sent to all the banks concerned in this story, but OCBC was the only other financial institution to respond. This controversial power plant is emblematic of Vietnam’s energy production strategy over the next decade, a period during which electricity consumption is expected to triple. While many countries around the world are focused on phasing out coal-fired plants, Vietnam is going in the opposite direction. According to the government’s long-term master plan on power and energy generation, which was approved in March of 2016, the country’s share of power created by thermal plants will increase in coming years. The plan forecasts that coal-fired thermal power will account for 49.3% of all electricity produced in Vietnam by 2020 before rising to 55% by 2025 and dipping to 53.2% by 2030. By that point, the power sector will be consuming almost 130 million tons of coal per year. Vietnam’s leadership had once planned to enter the nuclear energy sector, with Russian and Japanese firms agreeing to help build plants on the south-central coast. However, this policy was abandoned in late 2016 due to the cost of the proposed facilities. Hydroelectric, wind and solar production is expected to rise by 2030 as well, but coal will still provide the majority of Vietnam’s energy for the foreseeable future. The petition directed towards DBS, which was launched on 6 March, had garnered 713 signatures as of the time of writing. CHANGE is aiming for 2,000 signatures by 22 March. Michael Tatarski is a journalist based in Ho Chi Minh City, Vietnam. He focuses on the environment, urban development and social issues. Find him on Twitter @miketatarski.